There is no objective criticism, nor is there objective art, and all those who boast that they put something different into their work, deceive themselves with the most deceitful of philosophies. Dmytro Dontsov is an outstanding figure in Ukrainian culture. Perhaps this name is primarily surrounded by Soviet myths. He was a persona non grata in the Ukrainian literature curricula during the Soviet times, and did not find his notable place and adequate interpretation in the new ones. Today in some Ukrainian circles (particularly, in south and east) Dontsov is labeled as a Ukrainian “fascist,” affiliated with Hitler and Mussolini. The figure of Dontsov is a blank spot in the history of Ukrainian humanities of the early 20th century. To fill in this gap, the Dontsov Research-Ideological Center prepared a series of books which would reflect the political, literary, culturological, and philosophical views of Dontsov. The second volume from the series Dmytro Dontsov. Literary Essays, which appeared eight years after the first volume, was published this year. The literary critic Oleh Bahan is the executive editor and compiler of the volume, and the famous linguist Yaroslav Radevych-Vynnytsky is its literary editor (Ihor Rymaruk was the literary editor of the first volume). The second volume was published in the Drohobych publishing house Vidrodzhennia. On September 28 the presentation of this book, initiated by the Kyiv-Mohyla Academy (and, in particular, the Panchenko Center for Modern Literature Studies), was held in the bookstore Ye. It was moderated by the president of the Kyiv-Mohyla Academy Serhii Kvit and Oleh Bahan. It’s a paradox, but as Bahan and Kvit stated during the presentation in the Ye bookstore, until the beginning of the 21st century Dontsov was not known in his native Melitopol. Today reading Dontsov in Melitopol is very formal, a tribute to some unknown cult; these readings do not find a social recognition. The east, in particular Melitopol — the world brought up on Soviet myths, where the Ukrainian Insurgent Army (UPA) warriors are fascists, and Bandera is an executioner of all Soviet people — cannot accept Dontsov, they cannot adequately understand his worldview. Of course, this part of Ukraine is still Ukraine but so far it seems to fail in finding its place in the big Ukraine. 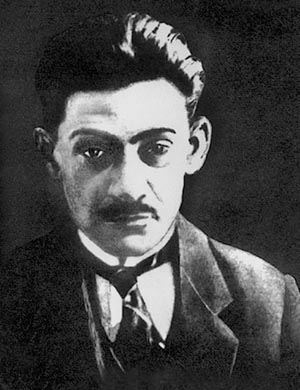 Dontsov’s position is first of all a position of a European intellectual who understood Ukraine as a specific constituent of the European historical and spiritual space. I should say that Dontsov is a person who had a brilliant knowledge of ancient cultures, who read a lot, and was educated in St. Petersburg. That is why Dontsov’s views are always supported by numerous facts. He does not speak without grounds that Ukraine should separate from the Russian space. Dontsov analyzed Russian philosophical thought and thoroughly studied Russian literature to realize the difference between the European and Russian types of thinking. Second, Dontsov wrote that the gap between Shevchenko, Storozhenko, Kotliarevsky and Hrushevsky was much bigger than the connection between the previous centuries. Ukraine started with Shevchenko, but neglected him, did not learn the achievements of the baroque literature, did not comprehend Skovoroda who is a representative of European tendencies in social thought (specifically, the European Enlightenment). For Dontsov European and Ukrainian cultures exist in continuity, in indissoluble unity. He deeply analyzed Shevchenko in the article Pamiyati velykoho vyhnantsia (In Memory of the Great Exile), but in the very first sentence compared him to Dante. Shevchenko had to leave his land, and Dante was exiled from Florence as well, for what he suffered and these sufferings are reflected in The Divine Comedy. A comparison like this shows a high philological culture of the author. Dontsov is a person of immense intellect who read in European languages: English, German, Spanish, Polish, French, etc. He often uses fragments from original European works as epigraphs to his articles. Dontsov lived in the time when mankind believed in the advent of a new civilization era, people believed that the fire of the revolution would destroy the grief of the past and would lead people to a new life. For this, it was necessary to choose the right pointer. Today, as I have already mentioned, there is a stereotype that Dontsov is an ideologist of fascism. His interest in Machiavelli is highlighted in this connection — The Prince was the favorite book of not only Dontsov but also Mussolini. However, one should consider that for Dontsov there are no cultural seams and chronological ruptures. For him the Renaissance era is actively present in the current time. He considers cultural phenomena not separately, not from the dimension of his time, but in the broad perspective. The Prince by Machiavelli is a work which reveals the fight of “human will,” when a person is not able to seize his emotions and pushes them against the emotions of other people. This results in the fight of all against all. Machiavelli is a rather delicate thinker, who fought for his homeland, who tried to develop the behavior code of a statesman in the most difficult circumstances. Well, perhaps the end justifies the means. One can make such a conclusion only from one historical dimension, but from the distance of big history this severe anti-humane example doesn’t seem so bad. Machiavelli wanted to prevent a bigger catastrophe by means of smaller catastrophes, knowing the anti-humane and predatory human nature. Therefore Dontsov’s interest in The Prince by Machiavelli is not a tribute to fascist tendencies, not the reflection of the cult of the Uebermensch: for Dontsov a statesman is an archetypal function of “human” which is not “too human.” Creating a concept of a statesman is an immediate task for a philosopher of any epoch. Since the essence of a person in both the 20th century and the Renaissance are the same, one can be guided by the achievements of the Renaissance theory of state formation, which reflects the dangers of the human ego very accurately. As Kvit points out in his preface: “The genre of Dontsov’s publications was of a great importance. Almost all of them are essays. This synthetic genre fully corresponded to the stormy interwar period. The brilliant stylist Dontsov, who sought a form of expression as adequate to those times as possible, understood its meaning very well. The essay presupposes the contextual elaboration of national culture, interpretation, but not stating various facts, selecting relevant information. Most importantly, essays become possible only thanks to an author’s vivid personality — then they are responsible self-expression of the author and require a whole-hearted nature and original thought.” During the presentation Kvit noted that the creative activity of Dontsov can first of all be defined as that of an essayist: Dontsov carelessly dealt with quotes, often quoted from memory. But it is not always so. In some articles Donstov is quite accurate in citing foreign authors. Another thing is that the space of the essay gave him many more possibilities to introduce his own thoughts. Reading European works, Dontsov realized that it is no longer possible to write as they had written before him in the 19th century. “Essays,” points out Kvit, “can be considered an embodiment of modernist definiteness as a mode of thinking. This feature characterizes the whole Visnyk environment (Yevhen Malaniuk, Yurii Klen, Olena Teliha, Oleh Olzhych, Leonid Mosendz, Oleksa Stefanovych, Roman Bzhesky, Daria Vikonska, etc. ), that was ideologically and to some extent organizationally grouped around Dontsov. It becomes a generator of new ideas for the stateless Ukrainian society that seeks revanche after the defeat in the liberation struggle. Owing to the editor-in-chief of Literaturno-naukovy visnyk (Visnyk), a fashion for essays is spreading in the Ukrainian intellectual milieu. Deeply political and also geopolitical, aesthetic and historic-philosophical thinking becomes universal and self-sufficient. Dontsov seemed to be ahead of his time in many ways — he wrote that Lesia Ukrainka was a person of medieval culture who still believed in the notion of God and Truth, but not the verity manipulated for the needs of reason. The salvation for Dontsov is sometimes connected with this returning to medieval metaphysics. Harold Bloom, an American theoretician, will express this very idea almost half a century later. Regarding Lesia Ukrainka, only now we started speaking about the notion of the “chivalrous ethic code” in her creative activity. Dontsov saw it already back in the 1920s. He polemized with Franko about the comprehension of Lesia Ukrainka’s creative activity: “The writer whom Franko once called a sole man among the poets of united Ukraine remained a kind of sphinx for the generation for which courage, enthusiasm, and will — all manly virtues — were to become mandatory if it wanted to oppose the horrible beast that attacked it. “I think this happened because Lesia Ukrainka with her preferences, passions and character, a typical figure of the Middle Ages, was born when Ukraine still didn’t leave the Middle Ages and didn’t return to them, as now. She lived and acted in an epoch, at the cradle of which a sad figure of the great plebeian Rousseau was standing. In the epoch which replaced an unknown God with the religion of reason. The absolute morality — with ethics, prescriptions of which, as mathematical formulas, were proved by logic. They replaced big passions with moderation, uncertain relations, which hardened the will and sharpened thought, with social orderliness, and general leveling and boredom together with it. They replaced Roman miraculum with the notion of inviolability of laws of nature and human coexistence. They replaced the faith that moves mountains with the blind capitulation before the so-called course of events” (Poetess of the Ukrainian Risorgimento). Dontsov realized that Ukraine (perhaps it sounded a bit “flaunting” and sometimes too emotional) should first of all leave the spiritual world of Russia because Russia belongs to the Asian world, and Ukraine belongs to Europe, which seeks development, not stagnation. Let’s present a rather long quote of our contemporary, the Russian professor Yashchenko: “Generally, the type prevailing in Russian literature is the weak-willed person, and he has a lot of nuances. Russian classics, in essence, are not classics, because they are not able to nurture strong, vigorous, and morally sound people. What characterizes heroes of our literature? Moral weakness and the will to justify this weakness by flaws of this life. Dreams about the future and total inability to realize the dreams in the present, inability to act, to creative struggle. Griboyedov’s Chatsky who escapes the aversions of life. Rudin and other Hamlets of Turgenev, Honcharov’s Oblomov and Raysky are fruitless blabbers and idlers, epileptics of Dostoevsky, insane creatures of Chekhov, unwanted people — these are the types of Russian literature. “These are people without their own willpower, who will not do anything unless ordered. “A Russian man is somehow designed so (wrote Gogol in Dead Souls. – Author) that he cannot live without a master. “A Russian man is a hopeless man. You want to do everything and can’t do anything. You think I will start a new life tomorrow, tomorrow I will go on a diet — not at all, in the evening of the same day you will be so stuffed, your look is blank and your tongue can’t move, you’re sitting as an owl looking at everyone. I’ll allow myself citing some more aphoristic and very accurate statements by Dontsov, which are also extremely debatable. “Europe and Russia are two cultural continents, divided by the ocean of mutual misunderstanding. This misunderstanding is also reflected in literary creative activity. “What is a ‘homo europeus?’ he asked Valery and said: ‘It can’t be denoted by race or language or customs, only by aspiration and the force of will.’ That’s what our literature and our life lack and what we will vainly look for in Russian literature! “What is Europe? It is a continent which in the war of a few hundred years repulsed the foreign invasion, conquered three other continents entirely and the fourth one (Asia) to a great extent. Thus, this must be an unusual race of people! What race is that? This is the one for which the world is a game of adventures and unceasing struggle. We still didn’t assess the role of Dontsov in the formation of Ukrainian modern literature, we didn’t link his heritage to the analogous tendencies in European literatures and cultures of the early 20th century, in particular, in Spanish literature, where the topic of the national revival, the formation of nationalism as an ideological-worldview position becomes topical after 1898, notably in the works by Unamuno. Similar studies still wait for their authors. At present it is important to get rid of other thing. As Kvit pointed out, once someone asked in a bookstore whether they had Dontsov, and heard the response: “We didn’t know that Dontsova’s husband is also a writer!” Situations like this only show the provincial nature, against which Dontsov struggled during his entire life. Literary critics should pay more attention to Dontsov as a participant of “Literary Discussion,” as an opponent and “interlocutor” of Mykola Khvyliovy (unlike Khvyliovy, Dontsov had a possibility to read not only Spengler in the Russian translation, but also important European philosophic-culturological works in the original); it is important to revise the modern understanding of the notion of the “Prague School” and mostly use the notion of “vynykivstvo,” what is more accurate, according to Bahan. In a word, reading Dontsov is a possibility to form the connection between the Ukraine of the 21st century and the one of high spirit, exploit, intellect and dignity.